The PowerUp FPV brings out the kid in you, including the repeated failures. One of the earliest flying devices kids become familiar with is paper airplanes, as rudimentary as they may be. Taking that concept and applying it to a consumer drone is all the more interesting when trappings like a camera, live streaming, and an FPV headset are added to the mix. 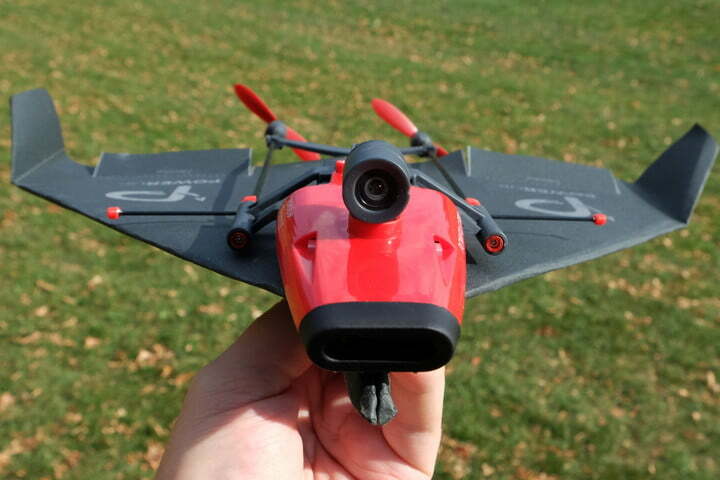 This is the PowerUp FPV, a successor to the PowerUp 3.0, borne out of a Kickstarter campaign in partnership with Parrot, which is already known for its own lineup of drones. Digital Trends got some hands-on time with this unique drone, which is still in beta, so our experience is based on what we had to work with. Included in the box is the primary frame, along with a stabilizer rod that clips onto it, plus a 550mAh battery (the same ones used for Parrot Minidrones), and eight sheets of paper to fold into plane designs. A microSD card doesn’t come with the unit, but it does support cards up to 32GB for recorded video and photos. The basis of the body is made up of the two 13-inch carbon fiber struts that are spaced out about 3.5-inches apart. Two propellers attach to their ends on the back where the motors are. The nose holds the electronics, including a compass, since the PowerUP FPV doesn’t have GPS for location data. Two LEDs indicate status, where green is good to go, amber indicates half the battery life, and red is really low battery. These colors can also be combined to create other indications, such as when the drone is in the process of updating its firmware, for example. The camera shoots in 640 x 480 resolution and manually rotates fully to view footage from any angle, except straight ahead is the most unobstructed view because there is no way to angle it up or down. Even straight ahead, the drone’s nose is visible at the bottom of the frame, so there is no way to get an entirely clear view from any direction. We were initially confused by the included strap for the cardboard FPV headset because it was too short for wrapping around a person’s head. It’s actually for the reverse purpose of securing the phone in the slot so that it doesn’t fall out while tilting your head in FPV mode. In fact, you’re not supposed to fly this with a headset that straps over your head to begin with, a confusing point that is to be clarified with instructions and a drawing that will come with the unit. 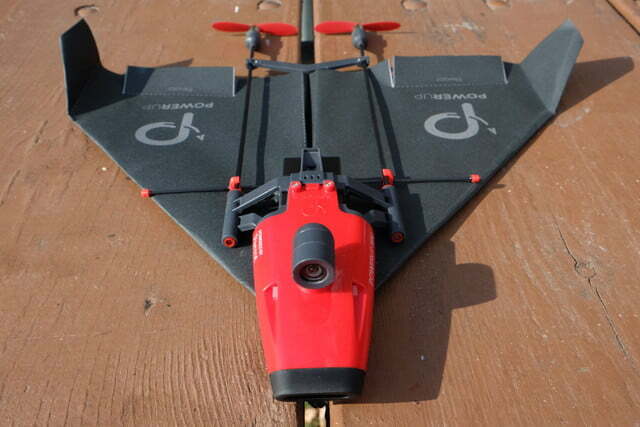 Either way, the drone works with any Google Cardboard headset. The paper in the box felt like the thicker construction stock we might have been crafty with in elementary school. PowerUp FPV suggests standard tabloid or A3 printer paper 110 GSM or 28-pound stock, all of which is widely available at print shops. By default, the “Invader” is the design chosen for the included sheets, but there are other templates the company has recommended, with instructions on how to fold them. More designs are reportedly coming, and PowerUp is encouraging users to experiment with their own designs. Despite visual indicators on the included papers for the Invader design, we found the best instructions were online via YouTube or the PowerUp website. Sliding the paper airplane into the frame was simple enough, since it’s really about aligning holders to keep it in place. The front needs to be pushed up as much as possible, with the back clip also pushed forward to keep the paper from moving too much. The stabilizer rod is a particularly important piece, since it helps steady the body when clipped onto the struts as close to the battery compartment as possible. Using a pair of scissors, we cut open flaps for the elevator panels in the back to help with pitch. We then slid in the battery, the LEDs lit up, and we were ready to fly. There are two ways to fly the PowerUp FPV. 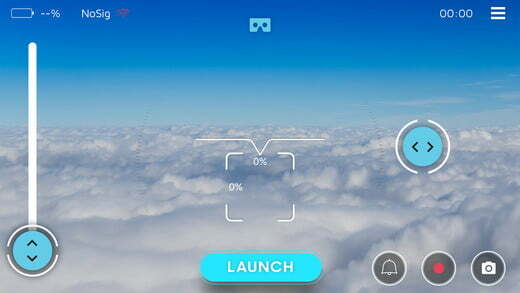 One is with the app on a smartphone or tablet, using virtual controls for flight and functions. 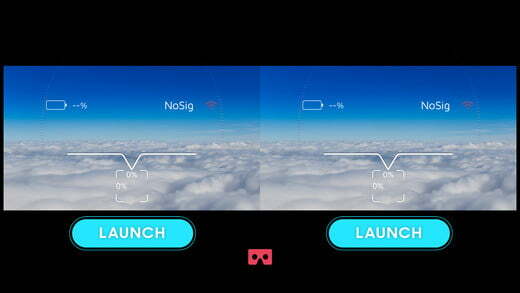 The other is to use the included Cardboard viewer with a phone and app to control the drone with head movements. A wide open field with distance from trees is the most ideal place to fly, a point made obvious once we got this thing in the air. The level of trial and error involved here gave us fits in certain instances. Being in beta, the iOS app was susceptible to strange glitches that required frequent re-launches and restarts on the drone to ensure the connection was stable. We were advised to put the phone or tablet in airplane mode to reduce cellular interference, though it’s not a requirement. And the fewer Wi-Fi networks in the vicinity, the better. The Android app was all but useless, which was understandable for something still in the alpha development stage. We could get the live view from the drone, but takeoff was an exercise in frustration, and the battery died terribly quickly. Ultimately, we stuck with iOS for hands-on flight. 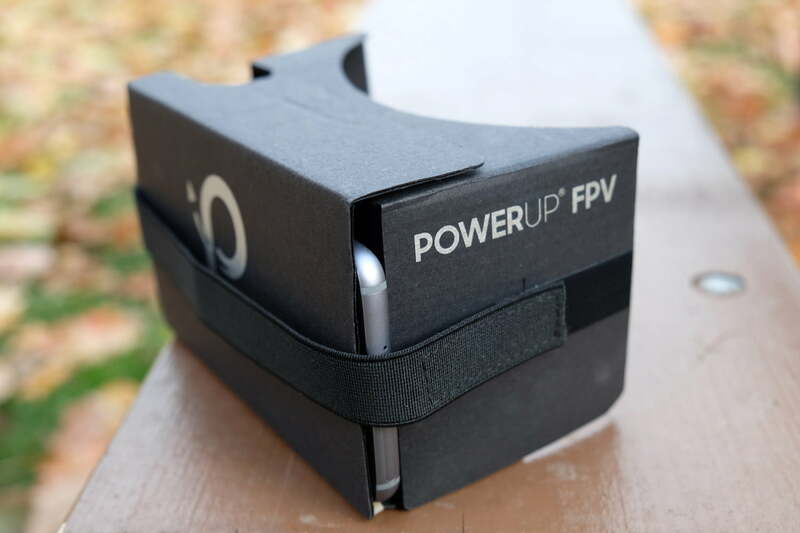 We followed everything to the letter, noting details in the various videos that PowerUp has posted about the FPV. The challenge here was two-fold. 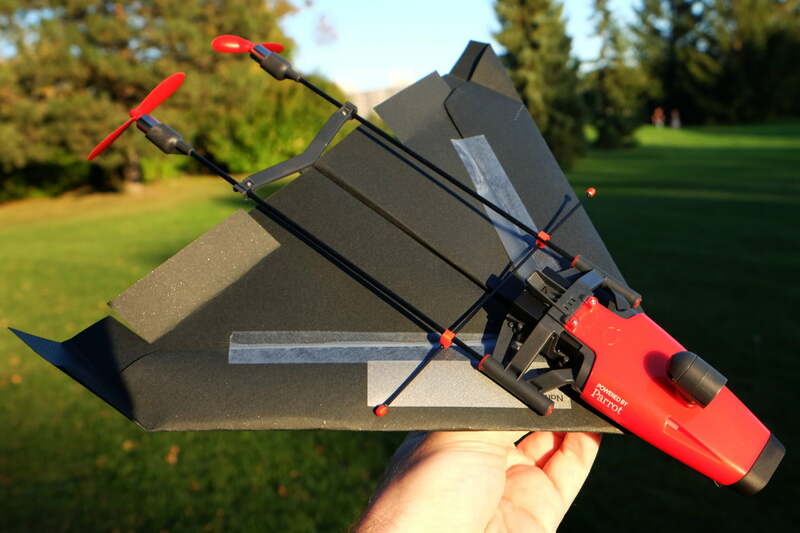 On one hand, the PowerUp FPV was unlikely to fly gracefully from the start unless the paper was folded precisely right. The other was takeoff and piloting. The drone has autopilot correction to compensate for imbalances, except we found results to be mixed in how that’s implemented. PowerUp developers recommended trimming one of the winglets after a few ill-fated flights to improve stability, but we encountered issues before that. A spotter is essential for piloting this thing with the cardboard headset. On the app, we pushed the thruster slider to 100 per cent, and then threw the drone forward assuming it would take off and fly. It nosedived into the ground immediately after we let it go — and did so a handful of times before we realized the problem. The key was to not have the propellers spin before letting go of the drone. We also had to use a more deliberate throwing motion without sudden moves to ensure a smoother takeoff. While we could understand the reasoning behind the methodical sequence, the fact it wasn’t made more obvious was problematic. It doesn’t take many aborted attempts before frustration sets in, so hopefully PowerUp provides more detailed instructions before launch day later in November. During flight, we found the onscreen controls a little difficult to manage in steering the drone on a more controlled path. This is a fixed-wing drone, after all, so it needs to move forward constantly, which makes piloting with a sense of precision more important. 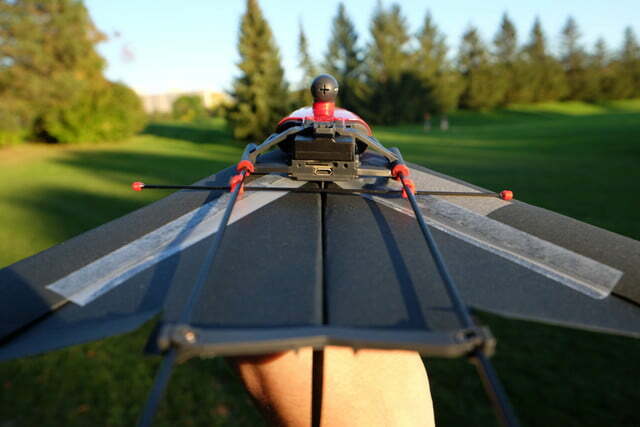 The PowerUp FPV has no rudders or other electronic components to help smooth out its flight. The internal gyroscope does a lot of heavy lifting, but thrust is manually controlled by the pilot. We would have liked to see a situation where the drone went into a circular holding pattern after takeoff in order to allow the pilot enough time to make adjustments before taking over control. Whether it’s food for thought or wishful thinking depends on what developers can do with the device’s limited on-board electronics. 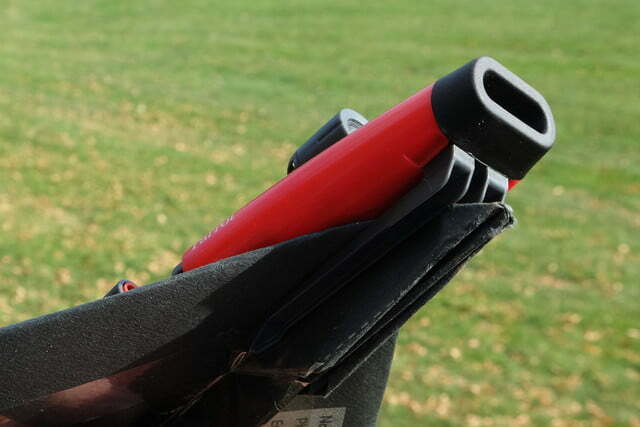 With its paper-heavy design, stronger winds invariably affect performance. PowerUp claims it can go up to 20mph in harsher wind conditions, which is probably true at full thrust, yet is really only attainable with a pilot who has a solid grasp on how to steer it efficiently. We tried flying in windier conditions, and it veered in different directions each time. The FPV mode adds a cool factor to the PowerUp that is easy to appreciate, except you can’t do it alone. A spotter is essential for piloting this thing with the cardboard headset, especially for the likelihood that it will land somewhere unintentional. Responding to head gestures, the drone turns left or right like your head, and climbs and dives based on tilting your head up or down. It’s interesting, but also disorienting. We could appreciate the app’s live view staring back into our eyes, though we became annoyed with the lag between our head movements and the drone’s. It felt like it was always playing catch-up. You’re not supposed to fly this with a headset that straps over your head to begin with. Adding to the app’s woes, we tried to update the firmware to add a newly-released “Return to Home” feature to the app interface, along with other improvements. It seemed like the update went off without a hitch, given the blinking light sequence on the drone, only to then find out that the update never stuck. We tried this no less than eight times with different sequences (kill the app, relaunch, kill Wi-Fi, etc.) and nothing worked. We’ve asked PowerUp for clarification on what the deal is, though we can reasonably assume a bug like that won’t make it to the final app version. A point about battery life — it isn’t very long under any conditions. We managed 10 minutes tops, and more like six or seven minutes because of the higher thrusts we ended up using. Extra batteries are almost a must in using this drone for any length of time. Driving to an open park relatively devoid of bystanders is more worth it when you can get this in the air longer. This deserves its own section because it will be integral to keeping the drone active. An extra pair of propellers and front bumper (with screws) are included in the box. A kit that includes two sets of propellers and two bumpers (with screws and screwdriver) are already available directly from the company for $20. The paper is pretty easy to find at stationary stores, though specific design templates may be available in the same stock PowerUp uses in the near future. However, other structural components aren’t currently offered. If a strut or motor breaks or the camera gets mangled somehow, there is no recourse for repair or replacement, forcing you to replace the whole body. We came away a little torn with the PowerUp FPV. The idea behind it is cool, and the way it looks and feels is hard not to like. When it flies, it shows real promise too. It’s everything that happens between setup and flight that we found somewhat maddening, and while we can chalk some of that up to weeding out bugs before launch, developers have work to do to make sure it warrants the price of entry. It’s already available now for pre-order for $200 and will launch by November 20. Retail availability is still reportedly in the works. That’s a little expensive for a drone that is more delicate than others in the same price range. We look forward to taking this out for more flights once the bugs have been squashed and the final version is released, but for now, we would be cautious before diving right in on this one.